LG OLED65C8PLA 4K OLED TV review | What Hi-Fi? Reviewing LG’s latest C8 OLED television could go one of two ways. It’s either a straightforward account of how the 65in version produces the same scintillating picture as its 55in sibling. Give it five stars, tweak the original review and job done. Or, it could be an awkward conversation around how the LG OLED65C8PLA doesn’t quite deliver on the promise of the smaller model. How the picture (and sound) quality still need to be better to justify the hefty £2800 price tag. If you’ve already spotted the star rating, you’ll know we have gone for the first option. But instead of ending the review here, we should really take a paragraph or ten to convey the brilliance of this OLED television. The way LG positions its OLED TVs means that features and specs are virtually the same across models and screen sizes, with the key variables being the speaker configurations and stand designs. The only extra thing to note for 2018 is the entry-level B8 range uses a lower spec, older generation Alpha 7 processing engine compared with the Alpha 9 found elsewhere, including inside the OLED65C8PLA. Apart from the show-stopping, wafer-thin W8 wallpaper TV, the C8 line is probably the best looking of the bunch. The table-top stand looks elegant in its gunmetal grey finish, swooping down gracefully from beneath the OLED panel and stretching across the TV’s full width. Within it lies a wide recessed and ridged channel which helps direct the sound from the downward-firing speakers out towards the listener. The speakers and the TVs connections (four HDMIs, three USBs, aerial, satellite, optical and headphones) are all contained inside a wide, chunky enclosure that takes up around a quarter of the TV’s back panel. The Alpha 9 processor brings a number of picture enhancements to the C8, including a four-part noise-reduction system, frequency-based image sharpening, object-based contrast enhancement and adaptive colour mapping. The TV can also apply dynamic metadata to a HDR formats that only carry static metadata. LG calls these HDR10 Pro and HLG Pro. High frame rate (HFR) content is also supported, but we’re not at the point where HFR movie content is readily available so it’s only really relevant for gamers. The C8 comes with satellite and Freeview tuners built-in, the latter supporting the catch up and on-demand offerings of Freeview Play. Here, catch-up services such as BBC iPlayer, ITV Player and Demand 5 can all be found under one roof. The set-up process hasn’t evolved massively since WebOS first appeared on an LG TV, but this is no bad thing. It’s still a fun and simple way to get your new TV up and running. Being in control of its own software has allowed LG to make subtle improvements to WebOS over time, improving its intuitiveness along the way. It’s still one of the more inviting TV operating systems we’ve encountered. The customisable tabs which span across the bottom of the screen work well, and give you quick access to popular apps such as Netflix and Amazon with all the 4K HDR content that they bring. New for 2018 is LG’s ThinQ AI artificial intelligence, which claims to make your TV smarter with the help of advanced voice controls. Chatting to your TV might be a bit of a gimmick, but here it feels a little more refined and useful with the ability to switch between different picture modes and TV channels part of the appeal. We doubt you’ll use it much, but it’s a step in the right direction. Of course, all the menu surfing is controlled via LG’s trusty Magic Remote and on-screen pointer. Over time this has become a smoother, more intuitive tool, but the presence of a D-Pad means you’re not required to act like a wizard-in-training. Out of the box, the OLED65C8’s picture isn’t a million miles away from being good, but there’s room for a little improvement. We begin by turning off the bulk of the TVs picture processing modes and reintroducing them one by one to see how they impact the picture. 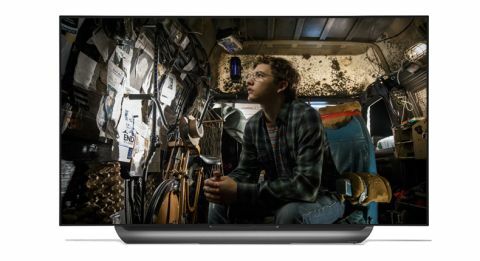 We settle on Cinema Home for HDR content and Standard for everything else (remember, you’ll need to assign picture settings for every source device you connect, including Dolby Vision content streamed from Netflix). One feature we would enable for 4K content is LG’s Dynamic Tone Mapping. This adds dynamic metadata to static metadata and seems to squeeze even more gradation and definition from an HDR picture, without any unwanted side-effects. To get the ball rolling, we start with the 4K Blu-ray of Despicable Me. The picture bursts bright with colour as the pristine blue sky clashes with the yellow sun-kissed sand in the opening scene in Egypt. There’s a jaw-dropping level of clarity and detail as you move inside Vector’s fortress. The punchy bright whites of the walls and the searing orange hue of Vector’s tracksuit all make an impact, but the TV falls short of burning your retinas. Small details like the denim texture on the Minions’ dungarees and the silver zipper on Gru’s jacket are all superbly rendered with no soft edges. Switch to The Last Jedi on 4K Blu-ray and the LG shows it’s equally at home with darker, more testing moments. As you’d expect from an OLED panel, the galaxy looks suitably black and inky as the Resistance evacuates D’Qar during the opening chapter. Viewing angles are excellent with little loss of brightness or contrast, even if you’ve been banished to the far side of your L-shaped sofa. As Poe weaves his way through the Dreadnought’s cannons, the LG picks out a sensational level of detail and definition on the huge ship’s underbelly. With turrets and Tie Fighters exploding all around, the LG captures the ferocity in the flames and carnage of the space debris perfectly. Motion processing isn’t the LG’s strongest point, but the C8 still keeps a firm enough grip of the action. While TruMotion has improved over the years, we’d suggest using the manual user option – on the lowest settings the C8 does a good job of tracking the Tie Fighters as they screech through the sky and attack the Rebellion pilots. It’s easy to forget how much work a 4K TV has to do to upscale a standard Blu-ray, or HDTV picture, and the LG should be applauded for its efforts. When faced with the 1080p Blu-ray of Fantastic Beasts And Where To Find Them, the stability and insight are commendable. As Scamander heads into the bank in pursuit of his runaway niffler, his skin tone looks nicely judged, while the blue of his jacket looks colourful and natural, contrasting nicely against the greys, blacks and browns worn by people around him. When the obscurial-possessed Credence wreaks havoc through the New York night sky, the LG’s ability to deliver solid blacks and excavate detail from the shadows helps produce an accomplished and watchable picture. TV sound quality has hardly come on leaps and bounds over the years, but it’s good to see the C8 offer a couple of features designed to give it a boost. The first of these is One Touch Sound Tuning. Using the mic on your Magic Remote and a number of different test tones fired out from the telly, the C8 will alter its audio balance to suit your room conditions. Compared to the TV’s out of the box sound, we find it gives a slight all-round boost – a small, but notable injection of solidity that helps shore up the sound. Dialogue is clear and expressive and the TV does a fair job of trying to add some weight and substance to more explosive scenes. We aren’t huge fans of LG’s second audio feature, Adaptive Sound Control, though. This processing mode supposedly optimises the sound based on the type of content you’re watching, although we found it tended to upset the overall balance. Certain frequencies seem pushed forward or held back at the expense of others and everything sounds out of kilter. Needless to say we’d recommend turning it off. Like the rest of LG’s 2018 OLED TVs, the C8 supports Dolby Atmos audio when fed from a compatible 4K Blu-ray. When turned on, it sounds composed and controlled with a fair amount of detail sent in your general direction, but if you’re expecting effects to soar overhead and around your sofa you’re going to be disappointed. You couldn’t really ask for more from the LG OLED65C8PLA. It does everything the 55in model does well, but in a larger package. We’ve no doubt 65in OLEDs from rival brands will be breathing down its neck, not to mention a Samsung QLED or two, but there won’t be many premium 2018 TVs that can match this level of performance at this size and for this kind of money.